With Disney ceasing internal development of Star Wars games, licensing deals might be Star Wars 1313's only hope. The gaming world was stunned yesterday by news that Disney would be closing down LucasArts, the videogame arm of Lucasfilm, which it acquired last year. Formed in 1982, the studio has been behind countless classic games, based both in the Star Wars universe and other original worlds. To the disappointment of many, the announcement confirmed that LucasArts ongoing projects were being cancelled, seemingly bringing a premature end to anticipated titles like Star Wars 1313. Sources inside LucasArts, however, are hinting that it might not be the end for the game just yet. While LucasArts is finished, Disney is far from being done with Star Wars in videogames. Rather than developing internally, the House of Mouse is apparently looking into licensing the Star Wars universe to outside studios and publishers. 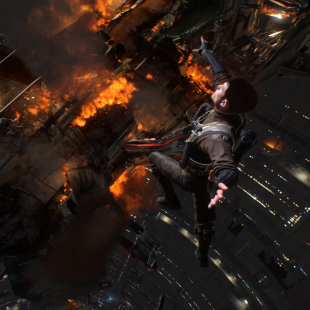 In turn, LucasArts representatives have suggested that a licensing deal could possibly save Star Wars 1313. "It is worth noting that we are looking for proven external partners who can help us provide videogames to our fans. We still believe in the videogame industry, we still will provide Star Wars games, we're just looking at different models rather than internal production," said LucasArts. "They're evaluating everything. There's always a possibility that it [Star Wars 1313] can still come out via licensing." Despite this possibility, other sources within LucasArts, speaking to Kotaku, have painted a less hopeful picture, putting chances of a 1313 revival at "effectively zero." Some chance or none, the salvation of 1313 would be welcome news for Star Wars fans. The game, first revealed in June of 2012, impressed many with its gorgeous visuals and adult-oriented take on Star Wars. Rather than centering on the Jedi, it promised to put players in the shoes of a bounty hunter working for a crime syndicate in the seedy underbelly of Coruscant. Focusing on gunplay and gadgets instead of the Force, it looked like something fresh and different, and there are still likely plenty of fans relishing the opportunity to give the game a spin, with or without LucasArts at the helm.